Paverpol will introduce you to an entirely new hobby. 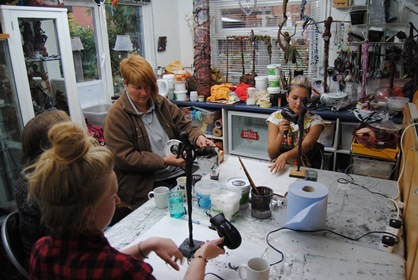 If you are interested in creating your own figurine, sculpture or wall art, as a certified Paverpol instructor I will be running one-day workshops to demonstrate the exciting possibilities and how to get the best results. First time workshop attendees will have the opportunity to create and decorate a 40-50cm figurine, which can be taken home on completion. No dates have been booked as I'm just waiting for you to contact me to book a slot. I give workshops for 1 to 4 people. Upon request evening and weekend sessions are available. For more information feel free to contact me. Coffee and tea will be provided during the day, however please bring your own packed lunch. It is recommended to wear old clothes, as dipping in Paverpol can get a little messy. Currently all workshops are given in my studio at my home address in Horsham, West Sussex. See Contact Information for more details. If you would like to book a workshop, please contact me.